Renowned photographer Andy Ryan spends much of his career photographing exceptional works of architecture. If you were to check out his Instagram, you would see it is dominated by expansive bridges, city skylines, large historical monuments, and skyscraper after skyscraper. Ryan is not new to photographing objects that are larger than life, but when he was given a project that had to be life-sized … that was quite different. Chicago Backdrop company Expressive Structures was approached by Studio 125 working in conjunction with the creative vision of Events Inc. and the Massachusettes Institute of Technology to collaborate with a photographer discovered and hired by Kate Straus with Events Inc. to photograph a home for a memorial for one of the employees at MIT, Dr. Marvin Minsky. Dr. Minsky was a highly respected scientist who spent much of his life working within robotics and was the co-founder of MIT’s AI laboratory. 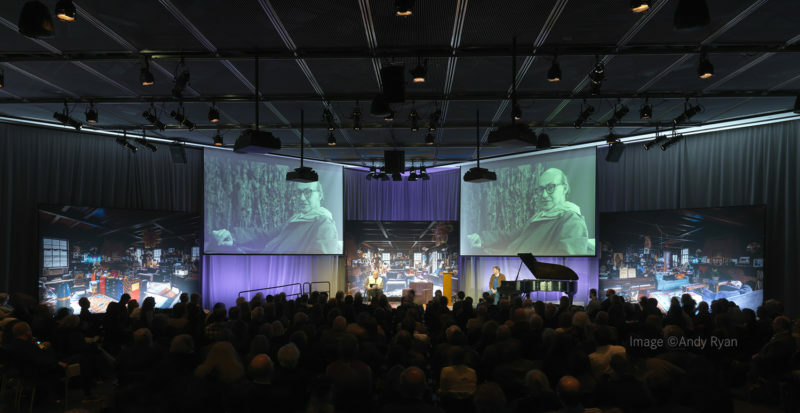 At first, the project was to be a simple pipe and drape solution with custom printed banners for the memorial service held at MIT. Then, after a more in-depth conversation with the Studio 125 and the Events Inc. team a decision was made to display the photos on a 10’ tall x 40’ wide wall to create a more dramatic impact for the event space. That was the plan until Andy Ryan arrived at the Minskys’ house and saw the Minsky living room. Friends, family, students, colleagues, and everyone else important to Dr. Minsky had been welcomed into this living room, which he used as an office since he started work at MIT in the 1970s and all of Marvin’s extremely personal belongings were still scattered around the room as if he was still there perhaps about to return at any moment. It was then, in the Minsky living room that Ryan knew the scope of the project had to change. After another conversation with Studio 125 and Expressive Structures, the pipe and drape solution that turned into a 10’ tall x 40’ wide wall solution morphed into three, giant 10’ tall x 16’ wide panels to honor the integrity of the photographs and displaying the full scope of the Minsky living room. 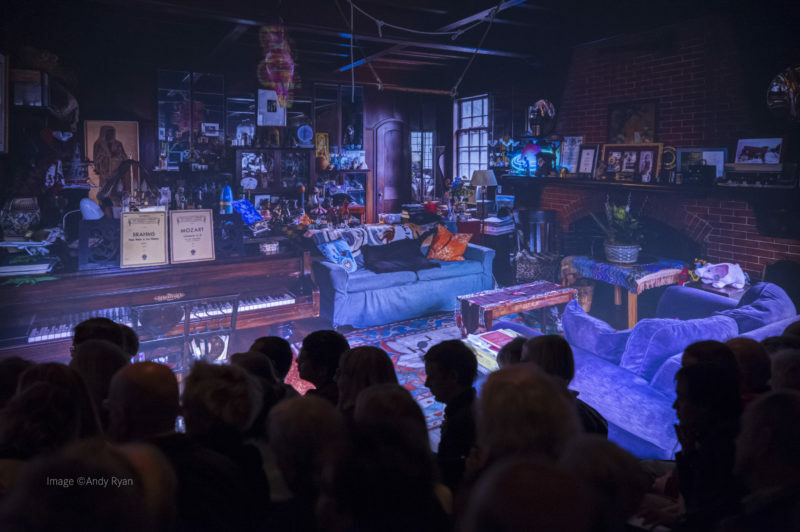 When people arrived at Dr. Minsky’s memorial, they were transported to the very living room in which they had come to know and love Dr. Minsky. The image size of the full living room was larger than life and in front of the panels sat a couch where speakers could address the audience. The set transported the audience to the very room where many of them shared memories of Dr. Minsky. When Ryan went to photograph the space, he was amazed by how unique the area was and that led to the choice to not change a single thing of Dr. Minsky’s within or from the room. It was photographed just as he had left it. His first robotic arm prototype (made in the 1950’s) rests on a small table, there are some toys scattered around the space, and the pillows remain crinkled and used. By not moving anything and by choosing to use the true light of the space as opposed to many commercial lights, Ryan captured the true essence of the room and made it feel as though Dr. Minsky was just out grabbing tea. Even with the lack of commercial lighting used, the high definition image printed perfectly and had impeccable color matching. Ryan had not done anything to this scale before, nor anything like this subject matter. But after seeing the impact of size and working so closely with family and friends of Dr. Minsky, he hopes to do more work like this. After the memorial, MIT decided to keep the panels in their lobby, facing large windows on the ground floor so that the MIT community and passersby could continue to enjoy the images. “The mural was as lasting as the work he created,” said Ryan as he explained that the panels stayed in the MIT lobby for a year and were so gripping that people from the street would come in to admire them. Though they did not know they were looking at the room of a genius, they knew they were looking at something truly spectacular. All photos courtesy of Andy Ryan.